The psalmist and the skeptic and the prophet and the professor look at the universe in which we find ourselves, see the same stars, feel the warmth of the same sun, hear thunder pealing from the same sky, understand the processes by which nature unfolds in spring, retreats in fall only to regenerate again the following year, and yet often draw different conclusions from the same observable data. So, for instance, in response to the emergence of humankind, a non-theist might merely record the evolutionary data or might, like cell biologist Ursula Goodenough, marvel at the improbability, the mystery, and the grandeur of our existence. (See, e.g., The Sacred Depths of Nature (Oxford University Press 2000).) The traditional Jewish believer, by contrast, might offer a prayer to the Supreme Being: Blessed are You, sovereign of the universe, who has fashioned us from the dust of the Earth in Your image and breathed our soul into us. Is there another way, a way to attempt to understand one’s place in the cosmos that is consistent with current scientific knowledge, and yet recognizes the miracle of our presence without dependence on some supernatural being? Is there an approach to the cosmos which might be attractive to many, perhaps most, American Jews who do not believe in the traditional personal God who dominates the Torah, but nevertheless accept the existence of (and may even yearn for) some extraordinary power, force or spirit which pervades all that is? (See Post March 14, 2012) And, if so, is that path kosher? Let’s consider two possible systems, pantheism and panentheism. The term pantheism comes from two Greek words, pan meaning all and theos meaning God. Literally, then, pantheism is the belief that all is God, that God and the universe are coextensive. This formulation also means that there is no God but the universe. Today, pantheism comes in various forms, some of which are discussed below, but it is characterized by several key concepts including (1) the acceptance and utilization of science and the scientific method and (2) a strong sense, even a spiritual one, of an integrated relationship of all things in the Universe, unencumbered or unenhanced, depending on your view, by a supernatural deity. We revere and celebrate the Universe as the totality of being, past, present and future. . . . Its overwhelming power, beauty and fundamental mystery compel the deepest human reverence and wonder. All matter, energy, and life are an interconnected unity of which we are an inseparable part. . . .
We are an integral part of Nature, which we should cherish, revere and preserve in all its magnificent beauty and diversity. . . .
All humans are equal centers of awareness and nature, and all deserve a life of equal dignity and respect. . . . There is a single kind of substance, energy/matter, which is vibrant and infinitely creative in all of its forms. Body and mind are indivisibly united. We see death as the return to nature of our elements, and the end of our existence as individuals. The forms of “afterlife” available to humans are natural ones . . . .
We honor reality, and keep our minds open to the evidence of the senses and of science’s unending quest for deeper understanding. . . .
Every individual has direct access through perception, emotion and meditation to ultimate reality, which is the Universe and Nature. There is no need for mediation by priests, gurus or revealed scripture. . . .
For all of their stress on unity, however, pantheists are themselves by no means unified philosophically. For instance, as indicated in its Statement of Principles, the WPM favors a kind of monistic pantheism, that is, one which recognizes only one type of substance in the universe, substance that science, in particular physics, can describe. Other types of monistic pantheism also allow for only one type of substance, but understand that substance to be mental or spiritual. Dualist pantheism accepts that two kinds of substances exist and interact in the universe. In addition, pantheists debate whether and how to use God language. While all pantheists reject the notion of a supernatural deity, some pantheists still prefer to use references to God as a means of expressing their beliefs. So, for instance, some pantheists may hold with Spinoza that God and Nature are equivalent, while other pantheists choose to avoid using God language, perhaps thinking that such words are misleading and mask a true understanding of nature and natural phenomena. If much of this sounds familiar to Jews, apart from the reference to groveling, it should. Jews know a thing or three about oneness. According to the Torah, as Moshe (Moses) is recapitulating the law for the emerging Israelite nation, he asks the people to pay attention to his words with these: “Sh’ma Yisrael” or “Listen, Israel” (more conventionally, “Hear, O Israel”). “יהוה Eloheinu” (“HaShem/Adonai (is) our God”), he continued, “יהוה echad” (“HaShem/Adonai (is) one”). (See Deut. 6:4.) This call to take heed is, perhaps, not intended to be much more than an interjection in an otherwise dense legal oration, similar to the request to listen immediately prior to the recapitulation. (See Deut. 5:1). Over the centuries, though, the Sh’ma has assumed prime theological importance. We may disagree about what God is, even whether God is, but if God is, then God is one. Some modern commentators appear to share those tendencies. For instance, in a recent essay, Rabbi Bradley Shavit Artson talks about the “reality of an evolving, emergent, dynamic creation” in which “every natural event is related to every other natural event and to all natural events.” In his creation theology, “it is not God alone who is one. All is one. We are related to each and to all, as is the Creator.” (See Artson, “Revisiting Creation, Natural Events, and Their Emergent Patterns” in The CCAR Journal, The Reform Jewish Quarterly (Winter 2012), at 76.) “We are stardust — we are all stardust,” he writes. By singularity, Nelson is referring to the earliest moment in the history of the universe when, according to Albert Einstein’s general theory of relativity, “the temperature, density, and curvature of the universe are all infinite . . . .” (See Hawking, The Grand Design (Bantam Books 2010), at 129.) In plainer words, at its origin according to Einstein, the early universe must have been incredibly small, compact and hot. But metaphors are tricky things. They are, by their very nature, comparisons to and therefore dependent on an unrelated object. Consequently, if the referenced object changes, then the strength of the metaphor must change as well, and, in some cases, so too must the validity of the metaphor. Looking back as far as science currently can, Hawking calculates the size of our universe then as a “billion-trillion-trillionth of a centimeter.” (Id. at 131.) University of Michigan physics professor Fred Adams concurs, and notes correctly that this volume “is far too small to fully comprehend.” (See Adams, Origins of Existence (The Free Press 2002), at 45.) Within the first second of the Big Bang process, there was a period of cosmic inflation. Lasting the smallest fraction of a second, perhaps a millionth of a trillionth of a trillionth of a second, what became our known universe exploded in size from this infinitesimally small, dense, hot point to something a million trillion trillion times larger. Hawking compares this process of rapid cosmic inflation to a one centimeter diameter coin “suddenly [blowing] up to ten million times the width of the Milky Way.” (Grand Design, above, at 129.) But, of course, the starting size was not a one centimeter coin. Joel Primack and Nancy Abrams describe the result, post-inflation, as “the size of a newborn baby.” (See Primack and Abrams, The View From the Center of the Universe (Riverhead Books 2006) at 186.) 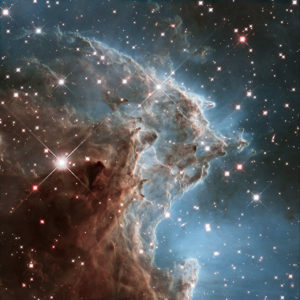 Less dramatic, but no less significant, expansion followed and is now accelerating. The point here is not that Nelson’s metaphor fails, but that it (1) demonstrates the risk in appealing to science, especially astrophysics, that is in flux and (2) takes us only so far. (Nelson himself recognizes its limits. See Nelson, above, at 26-32.) All this does not mean that the metaphor is not useful. To the contrary, it is very useful. Nelson’s Big Bang metaphor may not take us to the original quantum event which initiated the universe as we know it, but it takes us to within a split second of that event, and to a moment before we were stardust, before there were stars. It underscores the common source of all beings, of all things. And, to the extent it does, it is of a piece with the tapestry being woven by Plaskow and Artson, with material supplied by Einstein, Spinoza and, in some ways, the biblical authors of the Sh’ma. The intent here is not to label either Nelson, Plaskow or Artson as pantheists, merely to observe that some of what each has written is consistent with classic pantheistic expressions on the interconnectedness of the universe and the notion of the equivalence of God and nature. 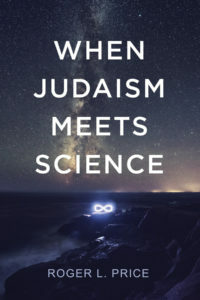 Contemporary pantheism, however, often rejects its Spinozan origins, effectively favoring pan over theism and resembling, in the end, a paganism against which Judaism has historically stood. There is, though, a related approach, panentheism, which avoids this problem. Panentheism does not argue that God is everything, but, rather, that God is in everything. That is, it allows for a God that is, in one or some ways, more than merely the sum of the parts of the universe. This orientation also permits new language to be written by poets about the interconnected unity of energy and matter and life, about humanity’s unique role in the natural scheme of things, yet with room for that unknown force or power or energy or field or whatever it was that preceded inflation in the Big Bang model and all that followed and will follow from that first inflation and then subsequent expansion as our universe continues its journey of evolution. In the cosmic drama that we have only recently begun to understand, Conservative Rabbi Jeremy Kalmanofsky sees “no religious response to the scope of space and time other than worshipping the Name of Existence—the sacred reality in which we participate, but that utterly transcends our place in the cosmos.” (See Kalmanofsky, “Cosmic Theology and Earthly Religion,” in Jewish Theology in Our Time (Jewish Lights 2011), at 26.) In short, accordingly to Kalmanovsky: “Finding God inhering naturalistically in all things — a theory usually called panentheism — is the only adequate religious response to science.” (Id. at 25.) Note that Kalmanovsky is not saying that there is only one response to science. He is saying that there is only one response which is both religious, that is, which includes some concept of (a) God, and adequate, by which he seems to mean serious in its acceptance of modern science. Pantheism, maybe, and panentheism, more certainly, seem to provide approaches which not only have authentic Jewish connections but may also appeal to what a substantial number of American Jews claim to believe, even if they do not know the names of the philosophies they have intuitively adopted. If this is so, why haven’t the seminaries and synagogues moved in this direction? Carl Sagan, an astronomer and writer who died too young in 1996, wrote that “(a) religion old or new, that stressed the magnificence of the universe as revealed by modern science, might be able to draw forth reserves of reverence and awe hardly tapped by the conventional faiths. Sooner or later such a religion will emerge.” (Sagan, Pale Blue Dot: A Vision of the Human Future in Space (Random House 1994), at 52.) What are we waiting for? This entry was posted on Wednesday, June 20th, 2012 at 6:08 pm	and is filed under Bible, Faith, Life Sciences, Physical Sciences, Spirituality, Theology. You can follow any responses to this entry through the RSS 2.0 feed. You can leave a response, or trackback from your own site. a language that not only is our formal means of communication but is a part of our behavior. “Natural languages” that are spoken in thousands of different ways by the billions of people on this teensy particle of the universe we call earth, we attempt to inflate our importance that implies we can actually conceive of deity. And does anything we are capable of conceiving be anything like the power or being or whatever that we are capable of conceiving? And we never know what is beyond our ability to conceive. Theologians have long addressed the inconceivable of what they have conceived, but decided this or that Almighty likes prayers and liturgical services, and many of us spend their entire existences attempting to fulfill what they believe this great entity expects, or demands, or wants, or God knows what. And we pat ourselves on the back because we no longer offer up our children to a Moloch who may be known by hundreds of different names. But we less-than-motes, with languages that describe imperfectly the world and humanity’s very existence, cannot face up to our inabilities. Some philosophers make that a system, too. We each shall pass, but while we are still among the sentient, there is an ample arena for humans to figure out why we kill and steal and hurt others because of the so-called power of a set of words. No, those words were not to justify the thefts of killings but to bring parts of us together so that we have company in this world. I am an Italian. I am an industrialist. I am a Muslim. I am a Jew. I am an Englishman. I am a construction worker. I am a Nigerian.. I am a Christian. And each of these words can be reasons to love or to kill. But before we learn what we really are, we, too, will be gone. Thanks Jerry, and I hope that you are not going anywhere soon. Each of us is, as you note, here for only a brief time. Indeed, all of human history has been relatively brief, occurring in something like 1/100,000th of the age of the known universe. So, as Rabbi Kalmanofsky writes in the essay I cited, “all this cannot be about us,” what he calls our “narcissistic little species.” And the attempts to explain our situation, to put it in context with the cosmos, can no longer rest on even the best poetry and allegories of men and women who millenia, or centuries, or even decades ago did not have the benefit of knowing what we know today. Albert Einstein once wrote that the “eternal mystery of the world is its comprehensibility. . . . The fact that it is comprehensible is a miracle.” Of course, Einstein in that phrase overstated our understanding of that “eternal mystery.” There is much we do not know, including about the most basic forces that brought us here. But we know so much more than those who came before us. Should we not express our appreciation and awe at our place in this marvelous universe with new language and new metaphors? And, because our time is uncertain, but certainly limited, should we not do that now and often? Browsing the Internet I found an interesting article (1). The author wrote that Spinoza “denied almost every major tenet of traditional Jewish belief, including that God created and controls the world…” How would Spinoza have defended himself against such an accusation? He would probably have turned to his own definition of God, as described in (2). The statement “God created the world,” he would say, does not have to be rejected if God is identified with Nature (with the entire world). “Nature is God” does imply, in my opinion, that the world was created by God. But I am a scientist, not a theologian. Our world–its material and spiritual components– evolved progressively over an infinitely long time. It was not created by an external entity (traditional God), during a well-defined period, such as six days, or six billion years. Laws of Nature, which Spinoza identified with God, control evolution of the world. Do you agree with me that such a scientific position should be acceptable to a significant portion of today’s scientists and theologians? If not, then why not? At the beginning of (1) Rabbi Schwartz referred to a large number of Jews without Judaism. I was one of them; I was an aggressively atheistic student in Communist Poland, as described in (3). And now I am a “Jew with Judaism.” Such an evolution, from one extreme to another, is conceptually easier if God is identified with Nature. This topic, like other topics mentioned in (4), is worth debating. Debates are essential components of Judaism. Cosmos, Oneness and Judaism just seem to go together in my mind. KOSHER for sure and yet you had to ask: “What are we waiting for?” Maybe the sources you quoted are the milestones on this theological journey. Personally I was fascinated by Carl Sagan’s exposition of the scientific postulations about the cosmos. His eloquent exposition enhanced my “transnatural” theology. It gave me so much to think about and was connected to why I still go into a synagogue and pray. There are still more questions than answers. Aren’t we all supposed to continue to consider these ancient ideas but with the tools and metaphors we have today and on into the future? Am grateful for your thoroughly engaging overview and exposition of this cosmic oneness which is a great Jewish tradition, if not pastime. I do not know whether Carl Sagan ever heard of, much less, read Aqabiah ben Mahalaleel. Your message may be the first time in all of human history linking the two. That’s OK. It is how we learn. Like the ancient sage, Sagan appreciated understanding and context. But in his Gifford lectures, Sagan also said that “if we ever reach the point where we think we thoroughly understand who we are and where we came from, we will have failed.” Whether one agrees with that view or not, there does not seem to be much likelihood that we will reach that point any time soon. So we continue to seek and search and wrestle with what we encounter, even as we are told our putative ancestor Ya’akov did over seven score generations ago. Absolutely agree with you – the process we undergo is important. There are too few discussions like this one anywhere! Oh my. That was а gooԁ read! I'd be curious to know what authors you have read on Panentheism. I have never heard your definition of it. It is consistent with Paul's definition of God (actually, his paraphrase of what he said "your ancient wise men" knew when he was speaking in Athens): that God is He "in whom we live and move and have our being." That, in a nutshell, is panentheism. The universe IN God, rather than God in everything. Sri Aurobindo includes both in his statement, Divine is in all (panpsychism, actually), all is in the Divine (idealism) and there is nothing else but the Divine (Pantheism, at least in part) – ultimately, this is Purna Advaita, or integral non dualism, as Sri Aurobindo refers to it. His colleague Mirra Alfassa, a Jewish woman from Egypt, studied the Kabbalah extensively and said that Sri Aurobindo's writings were consistent with her understanding.